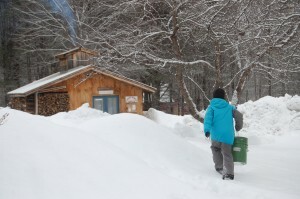 In 2006, with over 25 years of sugaring experiences with friends and families, Tim began making plans for building a sugarhouse on the land where he and Kate live. Construction began in the fall of 2006, when the concrete slab was first poured. The remainder of the the construction took place in the late spring and early summer of 2007. “4 Stooges Construction,” (as Tim fondly refers to his crew, comprised of his father, John, his brother, Ed, his friend and former sugaring partner, John D., and Kate’s father, Bob) constructed the sugarhouse in less than 4 weeks. The wood fired evaporator and arch were moved in late summer 2007 and Tim patiently waited for spring to come to begin boiling. He began running sap lines in the summer and fall of 2007, ending up with 475 taps for the maiden voyage year of Turkey Street Maples. March of 2008 marked the first draw of maple syrup in the new Turkey Street Maples Sugar House. The sugaring season ran until about mid-April this first year and 85 gallons of syrup was produced. We are proud to provide local New Hampshire maple syrup to all of our customers! Click here to view our production history. We do have syrup for sale! Please Contact Us to purchase some!